The IMS Question & Test Interoperability (QTI) specification describes a data model for the representation of question (assessmentItem) and test (assessmentTest) data and their corresponding results reports. Therefore, the specification enables the exchange of this item, test and results data between authoring tools, item banks, test constructional tools, learning systems and assessment delivery systems. The data model is described abstractly, using [UML] to facilitate binding to a wide range of data-modelling tools and programming languages, however, for interchange between systems a binding is provided to the industry standard eXtensible Markup Language [XML] and use of this binding is strongly recommended. The IMS QTI specification has been designed to support both interoperability and innovation through the provision of well-defined extension points. These extension points can be used to wrap specialized or proprietary data in ways that allows it to be used alongside items that can be represented directly. Metadata and Usage Data: A document that describes a profile of the IEEE Standard for Learning Object Metadata [LOM] data model suitable for use with assessment tests and items and a separate data model for representing usage data (i.e., item statistics). This document will be of particular interest to developers and managers of item banks and other content repositories, and to those who construct assessments from item banks. Results Reporting: A reference guide to the data model for result reporting. The document provides detailed information about the model and specifies the associated requirements on delivery engines. Integration Guide: A document that describes the relationship between this specification and other related specifications such as IMS Content Packaging [IMS_CP], IMS Simple Sequencing [IMS_SS] and IMS Learning Design [IMS_LD]. Because the QTI 2.1 specification is designed to accommodate a wide range of practices, conformance is defined in, and tested against, specific profiles. Such a profile can define which parts of the specification a community intends to support (items, tests, packages, results), and what specific features in each of those areas. In some cases, profiles can also include extensions to the specification, which are outlined in further detail below. Details about conformance related to both QTI and [APIP] are available on [ASSESS_PRIMER]. This page also lists the profiles that are currently available for conformance certification. 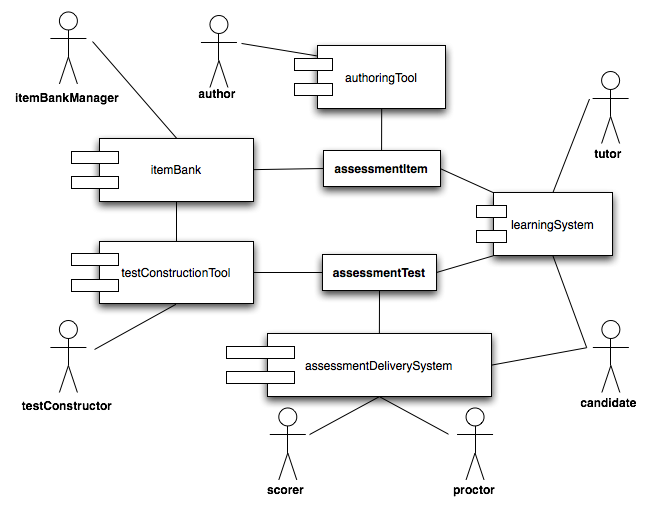 One of these is the QTI Formative Entry profile, which captures the same assessment requirements represented in Common Cartridge v1.x (based on a profile of the QTI v1.2 specification). Interoperability with this profile was demonstrated by systems involved in the development of the v2.1 specification. The IMS QTI/APIP Assessment APMG (Accredited Profile Management Group) is responsible for the ongoing maintenance of the QTI and APIP specifications, as well as those profiles that are available for conformance testing. QTI 2.1 can be extended in two ways: with Custom Interactions and Custom Operators. Custom operators are a means of introducing more sophisticated processing of candidate's responses. This is particularly useful where the responses are likely to contain subject specific constructs such as computer code fragments or mathematical proofs. Further information and guidance on using custom operators is available in section 3.4.1 of the Implementation Guide of this specification. Custom Interactions are a means of using interaction types that are not covered by the interaction types of the specification itself. These custom interactions trade a degree of interoperability for a wider range of user experiences. Because of the interoperability cost, care should be taken in defining such custom interaction types, since they may well be covered by a particular configuration of an already existing interactiontype. More information and best practice about sharing and running custom interactions is available at [INTERACT]. Work is underway to make types of custom interactions 'runnable', and therefore interoperable and sharable. More information will be made available at [INTERACT] in due course. If and when there is a next revision of the QTI specification, the IMS QTI/APIP Assessment APMG (Accredited Profile Management Group) will automatically take the custom extension into consideration for inclusion in the specification. In that case, the workgroup will contact the original submitter. IMS_LIP replaced with simpler IMS_LIS derived sourcedID structure defined under the QTI namespace for the identification of learners. New mathConstant element; returns mathematical constants as a single float, e.g. π and e.
Clarification of the meaning and handling of the initial state of sliderInteraction. Summary This document provides an overview of the QTI specification.